As Nicole mentioned mentioned in a post today, we were completely snowed-in until a entrepreneurial BobCat operator cleared our driveway (see her blog entry for pictures.) I was thankful for the modern mechanical marvel, especially given the fact that I spent an hour-and-a-half clearing the driveway last night only to have my work completely erased by snow drifts during the night. Seeing all the snow and the machinery makes me think of a pretty amazing piece of equipment designed to function in a similar environment, the Antarctic Snow Cruiser. I first learned of the novel approach to polar exploration about 4 years ago when someone at worked passed me a PDF detailing this vehicle (it was powered by two Cummins engines.) I was wanting to read about it again and thought I’d turn to Wikipedia for some more info. I was surprised to find little more than three sentences detailing this 55-foot long monster. Instead of shrugging my shoulders, I decided to write a comprehensive entry myself. As of today, about 95% of the info in the Wikipedia article was entered by me and I included as many links to external sources as possible. Without further delay, here is the article. 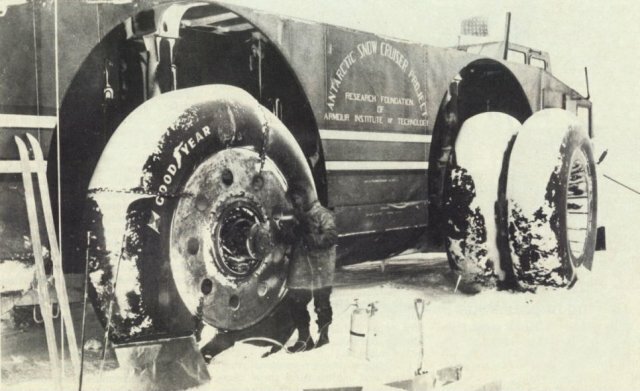 To pique your interest, here is a brief description: The Antarctic Snow Cruiser was built in the late 1930’s to explore the south pole. A crew of 5 was supposed to be able to live in it for a year without any external supplies or fuel. It could cross crevasses up to 15 feet wide. Unfortunately, the gaint smooth tires had virtually no traction once they touched the Antarctic snow and the vehicle was abandoned. The vehicle may still be buried under the antarctic snow and ice, or it may have fallen into the ocean when the ice shelf fractured.